The unbelievably beautiful and touching Hosanna from the Soweto Gospel Choir, the famous professional choir from South Africa. Renew in our own days your miracles like a second Pentecost. Grant that the Church, re-united in prayer, may extend the kingdom of Jesus - a kingdom of truth and justice, of love and peace. To say that the meaning is obvious and clear is not to say that it is ordinary, or simple to implement. The idea here is astonishing. The received wisdom of modern life is that self-assertiveness is the key to success. Dozens of experts will be glad to sell you a book explaining how to become self-activated, aggressive, ambitious; how to make others look up to you, how to rise to the top of the heap, how to run first in the rat race. For women, there is a special, gender-specific body of self-help work, that begins by teaching them shame at “being a doormat.” Meekness is failure. Once again, Jesus turns our knowledge topsy-turvy. He tells us that the kitchen maid will some day own the manor house. Preposterous! Yet, his credibility is bolstered by his rare ability to say, “Do as I do, not just as I say,” for Christ was the ultimate servant. And as such, he scored the greatest victory in history: triumph over death. 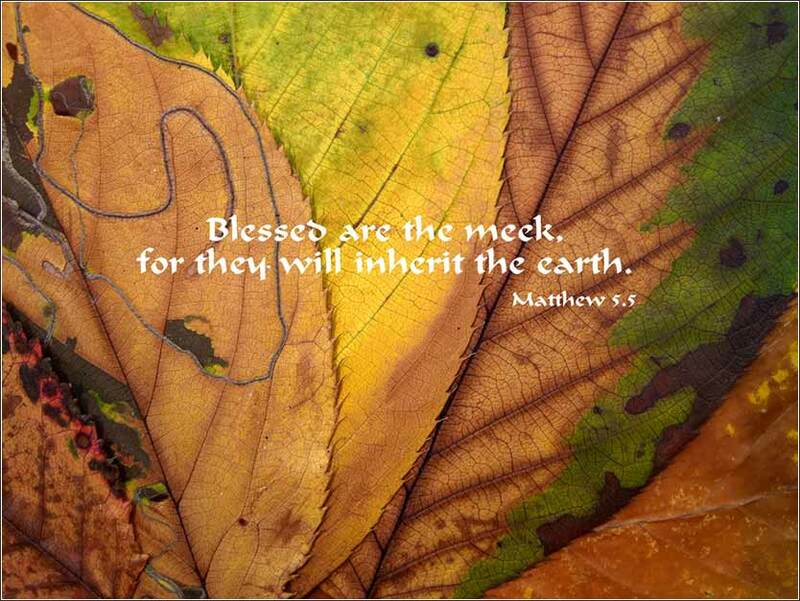 Merriam-Webster tells us that meek means, not simply gentle and submissive, but specifically “enduring injury with patience and without resentment.” Christ is called the “Lamb of God” for a number of reason, and here is yet another; for a lamb is the meekest of God's creatures. Judaism adds a level of understanding to inheritance. The passage can be translated, “they shall inherit the land.” To a Jew, the land is Israel. And up until now, one could hardly call the Hebrew method of acquiring the land “meek”. The covenant of Moses was a covenant of violence against the heathen tribes of Canaan. So in essence, Jesus is repudiating a central tenet of the Old Testament. Jewish listeners would have been astounded, hearing this for the first time. But unlike the Jews who first heard this, we already follow Christ. We trust his word implicitly; thus, meekness is our goal. And you know what? It works out rather well in terms of living our lives on earth. When we manage to control our anger and self-righteousness, we profit by it. Feeling entitled breeds resentment, from which proceeds all kinds of unhappiness. But being meek is not easy! Nor can we expect perfection. But by prayer and meditation, and using the power or the Spirit, we can wrestle our pride into a small corner; and our lives will know a peace that we might not have thought possible. 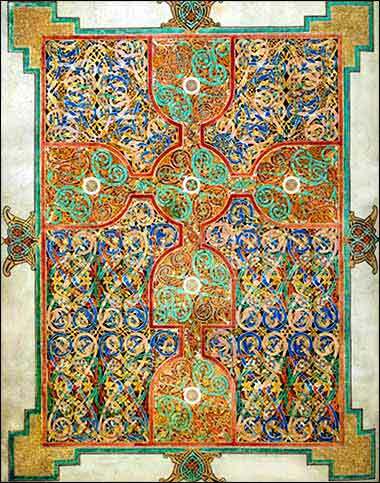 Evangelarium from the Lindisfarne Gospels, created around 700 A.D. at the island monastery of Lindisfarne, off the northeast coast of England.